The Caribbean island of Cozumel is Mexico's foremost diving destination, as well as the country's most visited port of call by cruise ships. Located twelve miles off the coast of the Yucatan Peninsula, across from Playa del Carmen, Cozumel is approximately thirty miles long and ten miles wide, making it the country's largest Caribbean island. With its bustling waterfront town, excellent shopping, lovely beaches, and great opportunities for underwater exploration, Cozumel is an ideal destination for travelers looking for a laid-back vacation with some prime diving opportunities. You can visit Cozumel on a day trip from Cancun or Playa del Carmen, or stay on the island for a deeper taste into what this island destination has to offer. 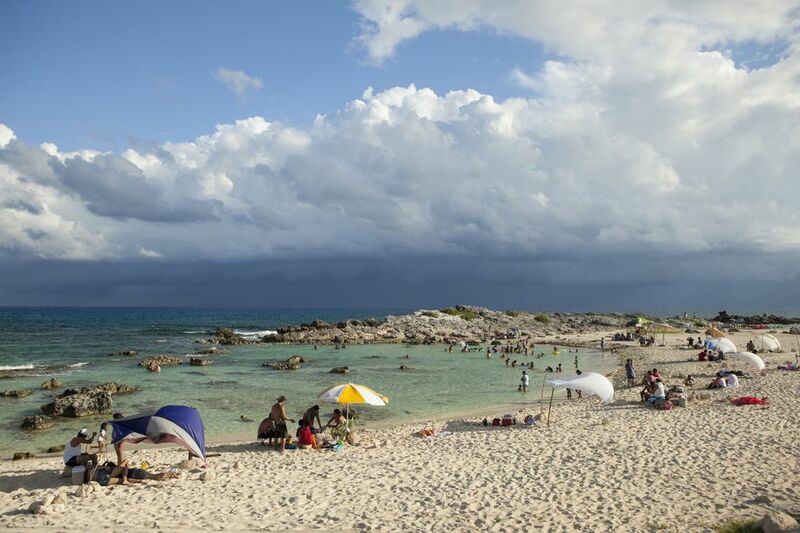 Here are some of our favorite things to see and do on a visit to Cozumel. The second largest coral reef in the world, the Mesoamerican Reef, is located right off the coastline of the state of Quintana Roo, and Cozumel is the perfect location from which to explore it. Its warm waters, excellent visibility, and towering coral formations make Cozumel a favorite spot for divers. You can snorkel from the shore, or take an excursion farther out to explore in the open sea. Reefs on the south side of the island are within the Arrecifes de Cozumel National Park, which begins just south of the International Pier and continues around the southern tip of the island (Punta Sur) and up a small portion of the east side of the island. The park consists of around 12,000 hectares (29,600 acres) of sea and coastline. Whether swimming, snorkeling, or diving, remember to respect the reef. Use biodegradable sunscreen, try not to touch or stand on the reef, and don't remove any of the sea life from its natural environment. Get a glimpse into ancient Mayan civilization at San Gervasio archaeological site, an ancient site on Cozumel island that has around 60 structures in various states of preservation. This was a shrine to the fertility goddess Ixchel, and according to legend, in ancient times, Mayan women would make a pilgrimage to the shrine to pay tribute to the goddess. She showed her pleasure by sending flocks of swallows, giving the island its name, which in the Mayan language is Ah Cuzamil Petin, which means "Island of Swallows". You may still spot some swallows, as well as other colorful birds, and the archaeological site also has plenty of iguanas wandering around, just waiting to have their photo taken. Chankanaab Park, which means "small sea" in Mayan, is a water adventure park with a nice beach, a picturesque saltwater lagoon, a botanical garden, and archaeological park with reproductions of a Mayan village and Olmec, Toltec, Aztec, and Mayan stone carvings. The beach is great for swimming and snorkeling, with lots to discover beneath the water's surface. For an extra charge, there are additional activities on offer including a zip-line, swimming with dolphins, kayaking, as well as snorkeling equipment for rent. This park has all the creature comforts, including recliners on the beach, hammocks, dressing rooms with lockers, and showers, as well as play areas for children. The facilities are good, and there is a buffet restaurant or waiter service by the beach. This park is a good option for cruise ship visitors and daytrippers, who may not have time to explore off the beaten path and want everything conveniently in one spot. The southernmost point of Cozumel island, known as Punta Sur, is home to an ecological reserve that is a sanctuary for iguanas, giant turtles, and more than 200 species of birds including kingfishers and pink spoonbills. The park has a beautiful white sand beach with good snorkeling just off the shore. A guided boat ride on the Colombia Lagoon is included in the entrance fee to the Punta Sur Park and offers the opportunity for bird watching, sightseeing, crocodile observation and more. Before leaving, be sure to climb to the top of the Celarain lighthouse to enjoy the spectacular view from above. If you'd like to learn a little bit more about the island's history, as well as its flora and fauna, a visit to the Museo de la Isla de Cozumel is just the thing. This small museum is conveniently located on the main street in the center of San Miguel and has four exhibit rooms, and a recreation of a traditional Mayan home behind the building. It won't take long to visit, but will certainly give you more insight into this special area and its fascinating history, from when the Maya originally inhabited the island starting around 300 AD through to the present day. The town of San Miguel sits in the center of Cozumel Island, on the side facing the coast. Many visitors to the island never venture beyond the cruise ship pier and the beachfront, but if you would like to see a bit of the real Mexico, take a stroll around the picturesque town square, and a few blocks beyond, to see some non-touristy shops and the areas where the locals live. Cozumel is a very safe destination and beyond taking the normal precautions against pickpockets and the like, you can feel perfectly safe exploring on your own. Cozumel has a great many shops for you to buy souvenirs for yourself or as gifts for family and friends. Some of the things you can buy here include Mexican chocolate, vanilla, and tequila, as well as pottery, jewelry, hammocks, clothes and all manner of handicrafts. There are many shops along the cruise ship pier, but these are mainly pricey shops designed to entice cruise ship passengers just off the boat. Visit the crafts market on the east side of the San Miguel main square for a good selection of crafts produced in many different regions of Mexico. Be sure to bring cash and be ready to haggle for some good deals.